Welcome to the second block of the Something New Sampler! You can find more information in our Flickr group and in the introduction post. 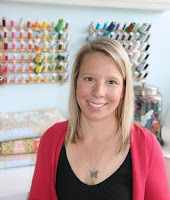 Sew along with us for a chance to win prizes! 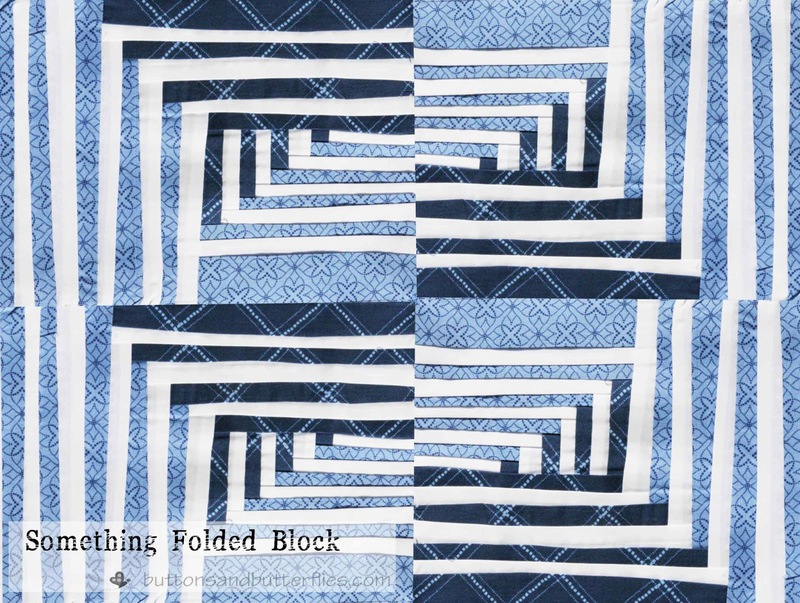 I'm Heidi and I'll be showing you how to make a Modern Folded block. I was intrigued when Amy asked if I was interested in doing something new this year. Something I have never done before. I think, as quilters, it is always important to not only hone certain skills we have, but also learn new techniques. 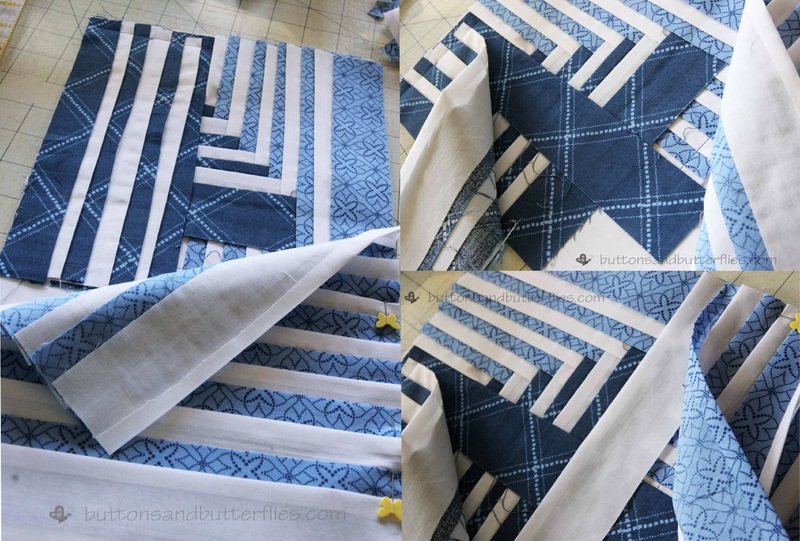 I have always been intrigued by folded blocks, especially the Moda Bakeshop Fancy Folded Star tutorial. When she asked me to take it on, I thought, why not? Then when she said they were going to a different block size than normal, I sorta panicked! But after some play, I came up with this. 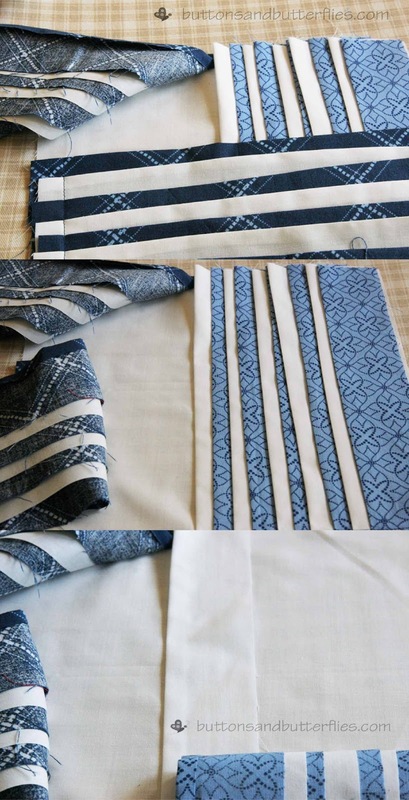 Step One: Cut your fabrics. 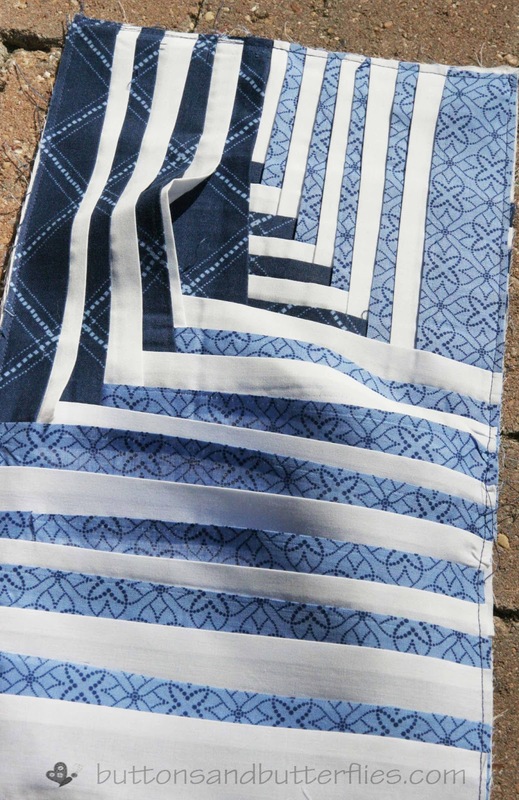 I was able to utilize 2 random Fat Quarter pieces and some scrap white fabric. 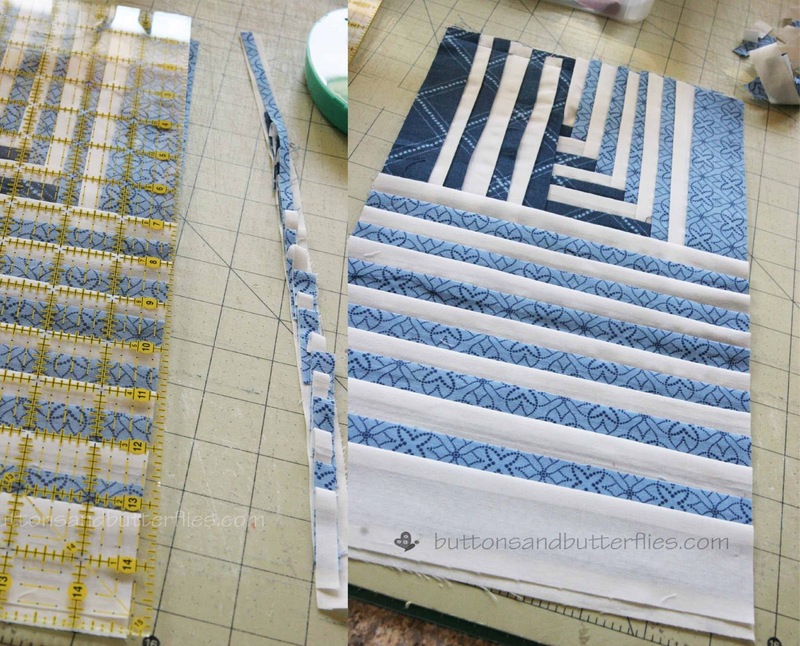 Step Two: Fold and press each white and blue rectangle 1/4 inch, lengthwise. 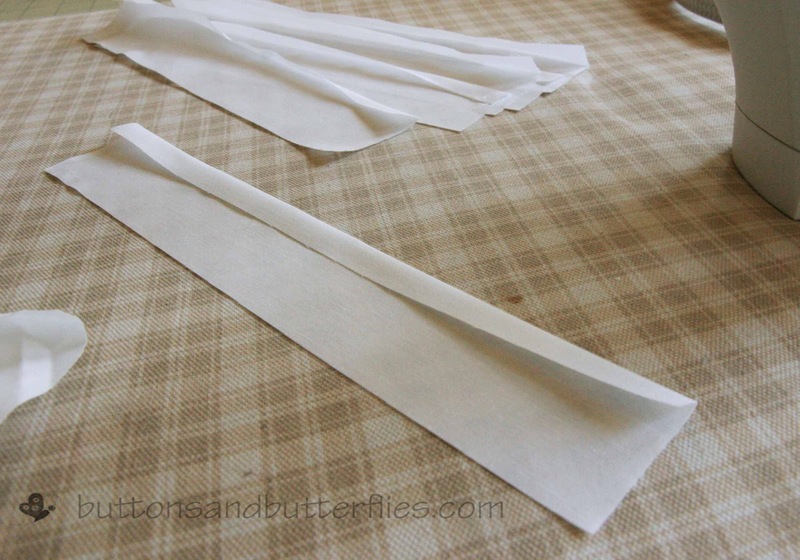 Step Three: Start laying your first set of folded strips. Start 3.5 inches in from the left side. Layer the 10 (one of each) folds in alternating colors to the edge. I used 1/2 inch intervals. 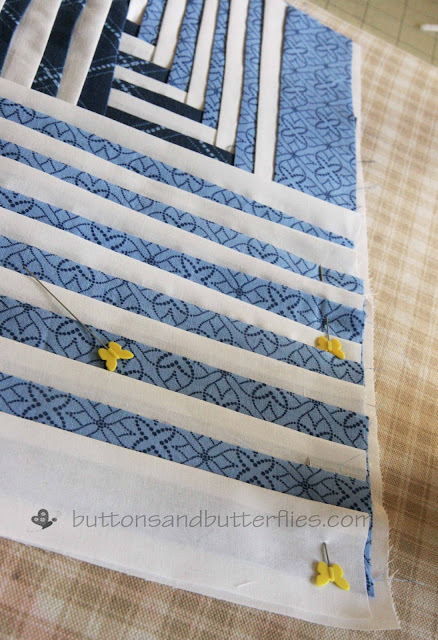 Pin and stitch the ends to the foundation piece of fabric approximately 1/2 inch from the bottom of the strips. You might notice that my strips are not perfect and a bit wonky. You could certainly do so, using your clear acrylic ruler as a guide, but I was having fun just eying it. Step Four: After stitching, begin stacking and layering the second set of folded strips (4 Dark Blue and 3 White) ever 1/2 inch. Lay them perpendicular to the first set of folded fabrics approximately 4 inches down from the top edge of the foundation piece. Stitch the edge like the first set. 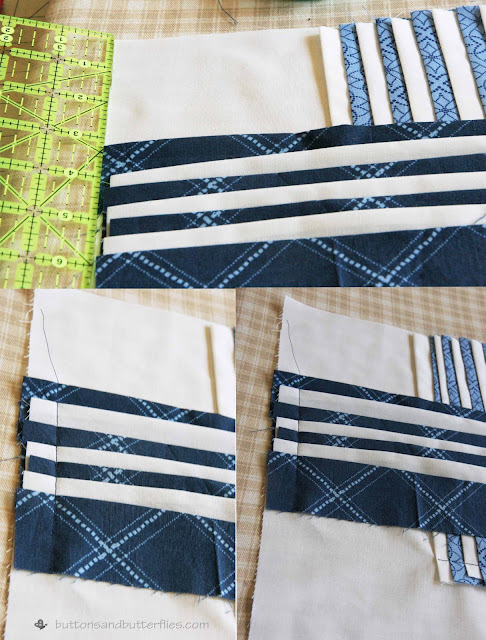 Step Five: The third set of folded pieces starts at the edge of the first set (4 Dark blue and 3 White). 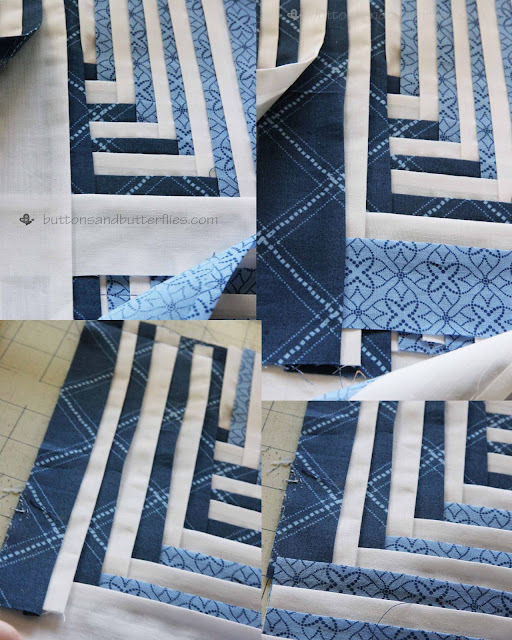 I started with the darker blue next to the first set's white folded piece. I overlapped them ever so slightly, but even if it isn't perfect, the foundation is white and won't really be tragic if it peeks. Again, alternate them every 1/2 inch to the edge. Stitch to the foundation piece at the top of the foundation piece. You may have to turn back the first set of folds to complete it. End at the edge of the last piece. Step Six: Now to prepare for the fun part, weaving! 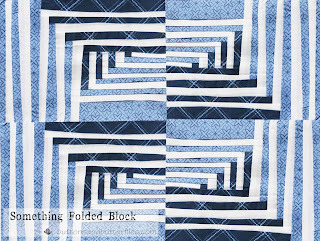 Folded blocks are all about weaving to get an interesting look or design. To prepare, carefully lift each set of folded blocks out to the edges and expose the foundation piece underneath. Step Seven: WEAVE! You can see above, that I laid the first white folded strip down first. Next, overlap the dark blue from the second set. Then, layer the light blue from the first set. Continue to alternate between the first and second set. Keep alternating to the end until the last strip of the second set is down and lay the last three strips down. 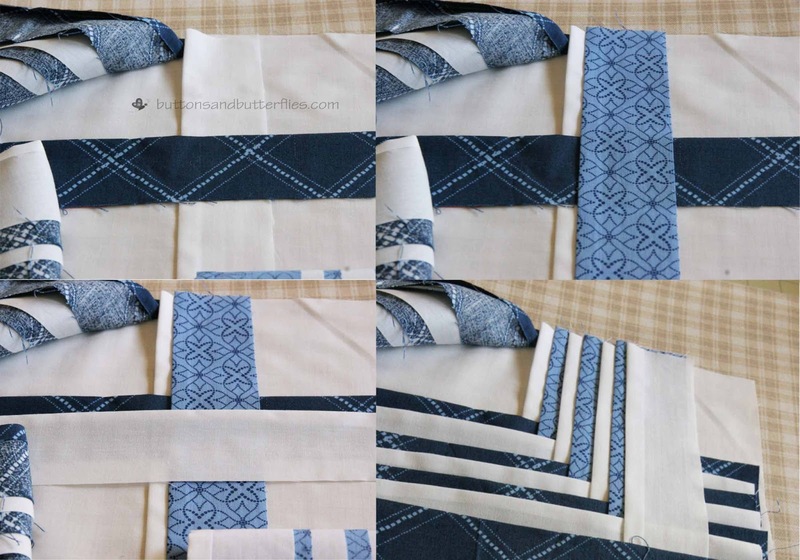 Step Eight: There is more weaving ahead, but first you must add the last and fourth folded set (6 Light blue and 7 White). First, return the third set of dark and white strips back over the other two sets. Then, start adding white and light blue strips alternating to the bottom (again, every 1/2 inch). Pin well when you have them set. Step Nine: Trim. 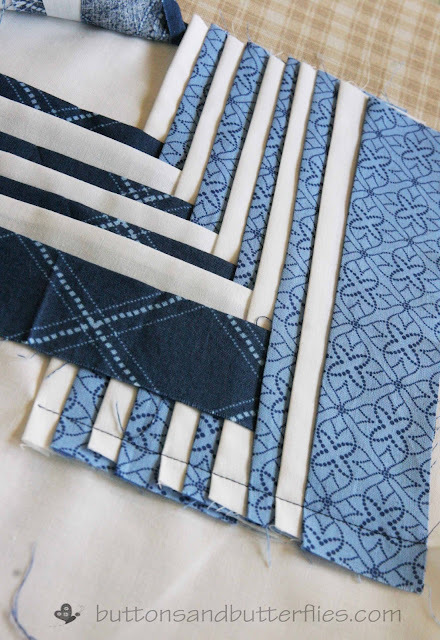 I decided to trim at this point to the correct block size of 7.5 x14.5 (final size with seams will be 7x14). I played around with proportions and liked that the light blue was a bit thicker on the left than the dark blue. I like to think that modern sometimes means improv...and I definitely went for it (out of my comfort zone). 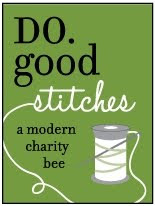 Step Ten: At this point, you could stitch all the way around the edges (less than 1/4 in) to secure all the ends. I would make sure you either hold the edges as steady and even with the machine or use a table attachment if you have one to keep the weight even on all the folds. However, I couldn't stop right there. I had to play some more! Step Eleven: I kept them pinned! Fold back the fourth set (lower set) of folded strips to expose the third set. Start alternating the dark blue with the lower set of folded strips. 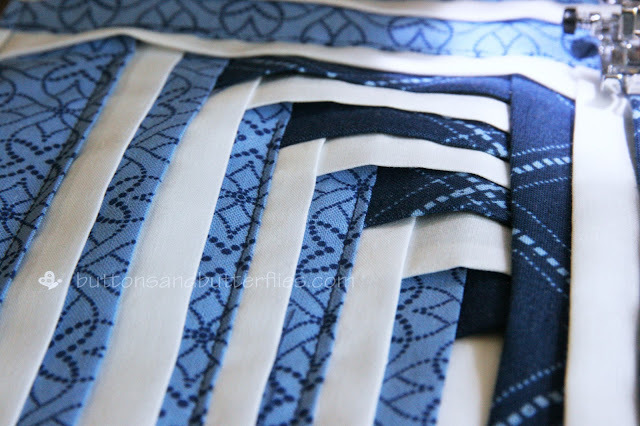 Keep layering until you come to the last two...they get tucked under the same blue strip. Stitch the entire perimeter of the block. Step Twelve: One last step. Stitching down the strips is needed. 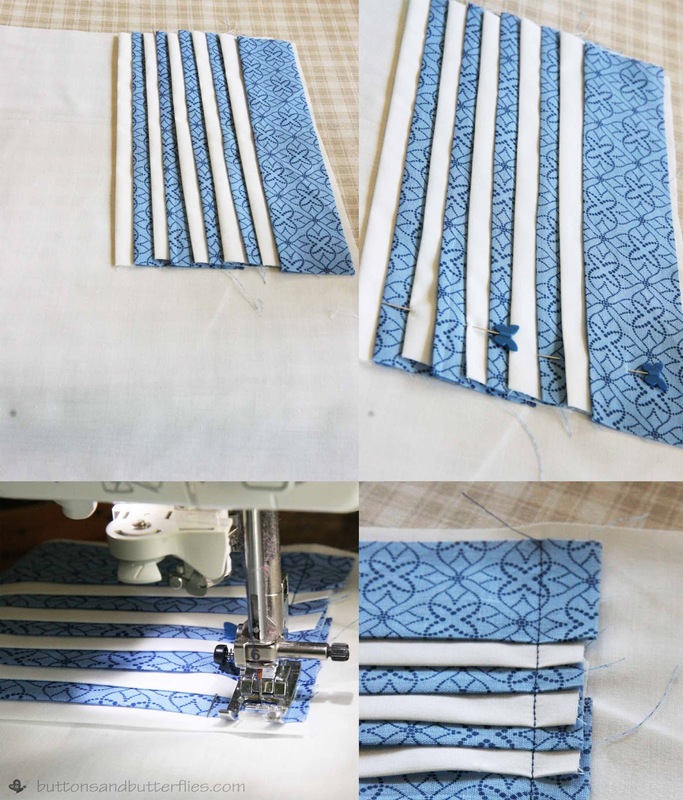 If this were a mug rug or to be for a final quilt, I would make sure I pinned the folded strips well and then sew individual strips like below with coordinating thread colors when I had my batting and backing. If you can't wait? 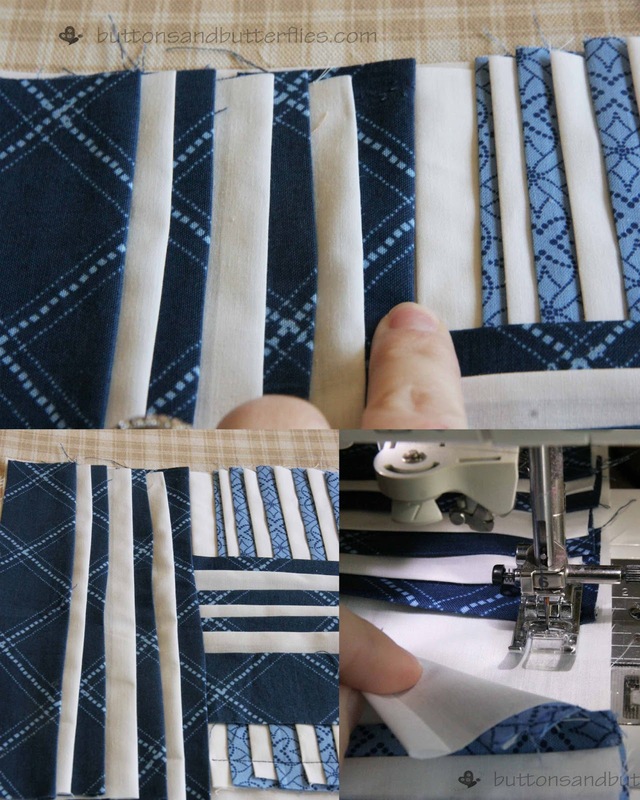 Go ahead and stitch the rows down. Watch out for shifting strips. Spray starch could be your friend in this instant to avoid puckering. Another lesson I learned is to start from the inside of the "center" and then work your way out. 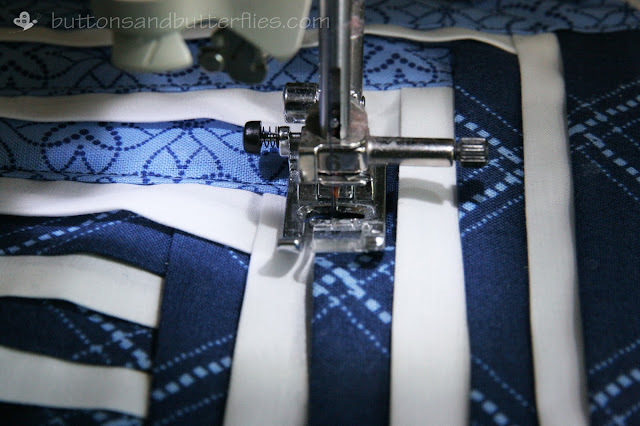 If you don't sew down some of the folds? You will get the above!!! 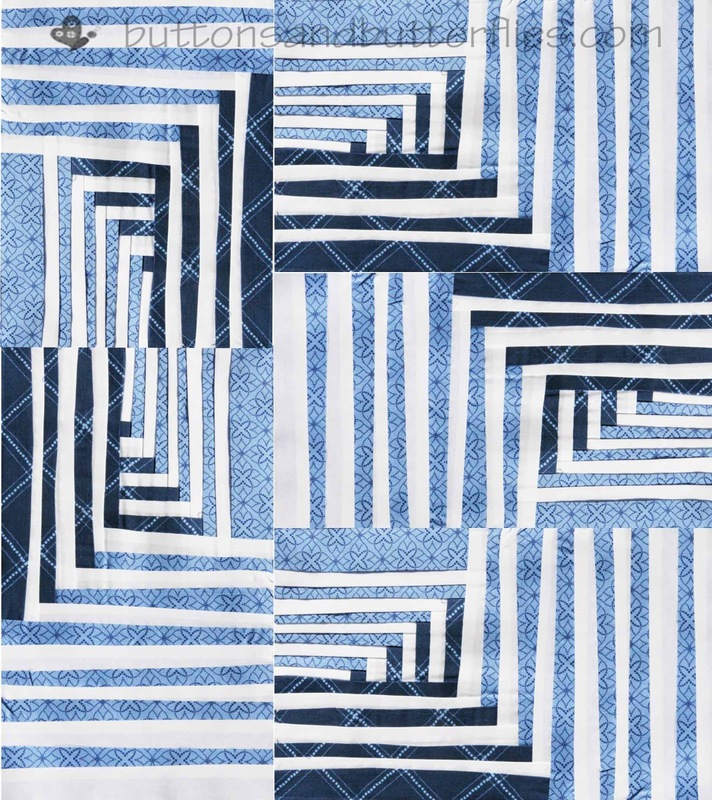 After playing around with the block, I decided to do a quick photoshop of what it would look like as a mini-quilt. If this block is just not floating your boat...never you fear....you can play around for days with your pieces. I did!! I also think it would be fun to do the block in a more square format! If you made it this far? Pat yourself on the back! It was a doozy of a post! If you missed last week's block, Modern Bargello, you can still go check it out at Amy's blog at thecutelifesmiles.blogspot.com. And I am not the only one with a block today, Chelsea @ pinsandbobbins.blogstpot.co.uk is hosting a scraptastic block today! Oooh, that's intriguing… I might have to try this. Adding it to the ever-growing list! very interesting! I think all the texture would make a great pillow cover or something like that. I think it's very Gee's Bend. Hmmm interesting technique, haven't seen this one before. Have to print it out and have a good read before I pull out my fabrics, thanks for the challenge! Wow, this turned out absolutely gorgeous!! Can't wait to make it!! I made mine today!! I had never tried a folding technique before. Great tutorial, Heidi. I'll post pics tomorrow in the flickr group. Hi Heidi, I am halfway through my block and I'm finding that when using the 1/2" spacing suggested I couldn't get all the pieces in the first set to fit across the white background (no drama, I left two off). 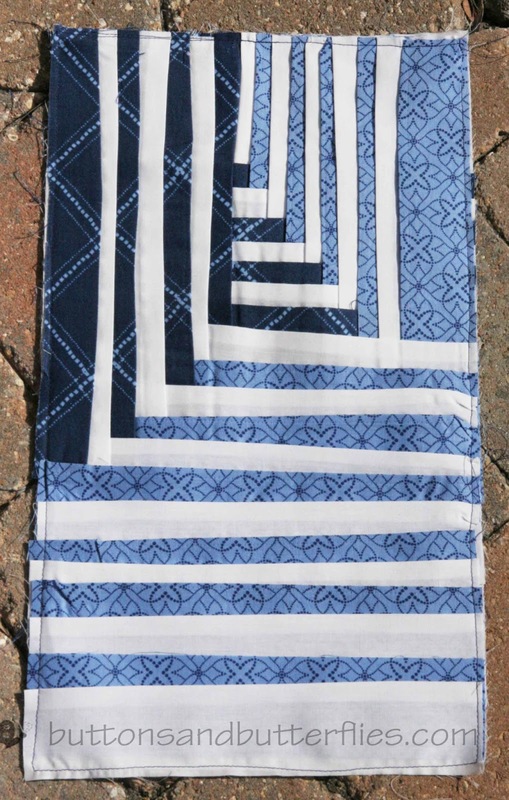 I also ran into problems when I was weaving the first and second set together in that I ran into the stitching at the bottom of the first set before I had woven all my second set strips through. I managed to get them woven by doing some sneaky snipping but thought I'd mention it in case anyone else has the same problem. There was also no way I could weave the third and fourth sets together. I'd suggest that having the strips 1/2" apart is too wide, maybe 1/4" might have made it fit. Anyway, I just have to sew everything down now and then I'll post a photo once I'm done. Mine will definitely be unique! I hope it isn't too much of a bear! I suspect that my "eyeball" of 1/2 might have shrunk in places to 1/4!! When I first was designing the block, I had started out at 1/4 and changed it to be wider, so it actually might still be closer to 1/4 than 1/2. Sorry for any difficulties!! Thanks for sharing! I really, really mean it! Feedback is perfect!!! Do you have a tip to iron the 1/4" on each strip quickly? TY! I eyed it, but you could certainly mark a piece of cardboard or a thin acrylic template with a 1/4inch...fold it over and iron. I also have a tool called the Dritz EZY-Hem you can use that is very effective too! Hi I have just finished this block and really enjoyed it. Haven't done anything like that before. I did find that I had to shorten the distance between the top folds to about 1/4 " and then had to spread out the last lot of fabric to about 1/2" which is fine, it gives it interest and a different dimension. It is quite a heavy block now but I really love it. Thanks for the great tutorial. It was pretty easy to follow. I am so glad you liked it! I have to go check out the blocks on Flickr again! It has been so busy. The block definitely lends itself to improv. Thanks for the tips for anyone that might be doing it in the future!